Check out the event group on Facebook to keep up to date on ticket sales and event details. Planning is in progress to run in April/May 2019, details to follow in coming weeks. It is a CCDA Sanctioned event running Challenge, Production and Open Class. April 7th to 12th 2019 This is it - The BIG ONE ! CLIFFHANGER has 100 National and International teams and is a combination of winch challenge, navigation, offroad cross country rally, and long course trials all in one massive outback location near Cobar, central outback,NSW. Base Camp makes it popular with families and friends as everyone camps together. Set in Outback NSW, teams compete in the vehicles in the ultimate test of survival. No pit crews, no home camp. The aim of the challenge is to keep both the vehicle & themselves functioning through the challenge to cross the finish line. Spectating packages are available. The Tough Dog Tuff Truck Challenge (TTC) is a three day, hard as they come, 4WD competition event. The TTC is gruelling and enduring, and provides a real test for competing teams as they push themselves and their vehicles to the absolute limit. Boulders, Rock, Mud, Giant Tyres, Deep Deep Holes and Ruts make up the terrain that competitors must conquer… in hope of taking out the annual perpetual Tuff Truck trophy. The next big thing!!! 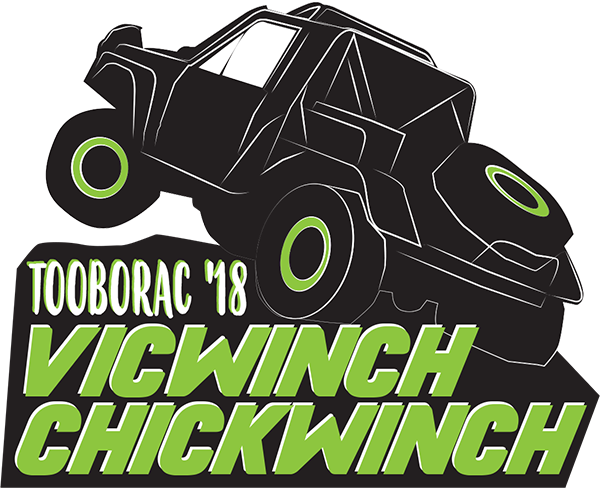 Tooborac VicWinch and ChickWinch – making its debut on April 20-22, Tooborac VIC. This entry level event prioritizes entries away from the top runners and gives the rest of the field an opportunity to shine. 10 spots will be prioritized to Chickwinch entries where the Driver must be female (male Navigator’s are allowed). The remainder of the places are set for those who have not placed as a driver in the top 3 at a 4WD Winch Challenge event. Head to www.4x4racing.com.au for more information No spectating available this year. THE CLIFFHANGER is famous for long fun stages, a base camp family friendly outback 4wd experience. Check out their Facebook page for event details. Back due to popular demand after an event return saw a huge demand after the 2016 event was run. Ironman 4x4 Adventure Challenge W.A. Extreme 4x4 Winch Challenge Event in and around Esperance W.A. After an event cancellation saw 2016 unable to run due to flooding in the outback, OBC 2017 will be back bigger than ever. A 7 day 4x4 endurance race though the Aussie Outback. It is the most prestigious 4x4 challenge in Australia. Held in the hills of Dederang, Victoria Repco 4x4 winch Challenge will be running for the 3rd year this year.